Aloha Scrappers!!! It’s been really hot here this week, so I have been busy getting ready for school (I homeschool) and doing lots of scrappy stuff. I have been doing lots of getting stuff ready when we start school and I can’t be online all the time for the new YT Channel I started. 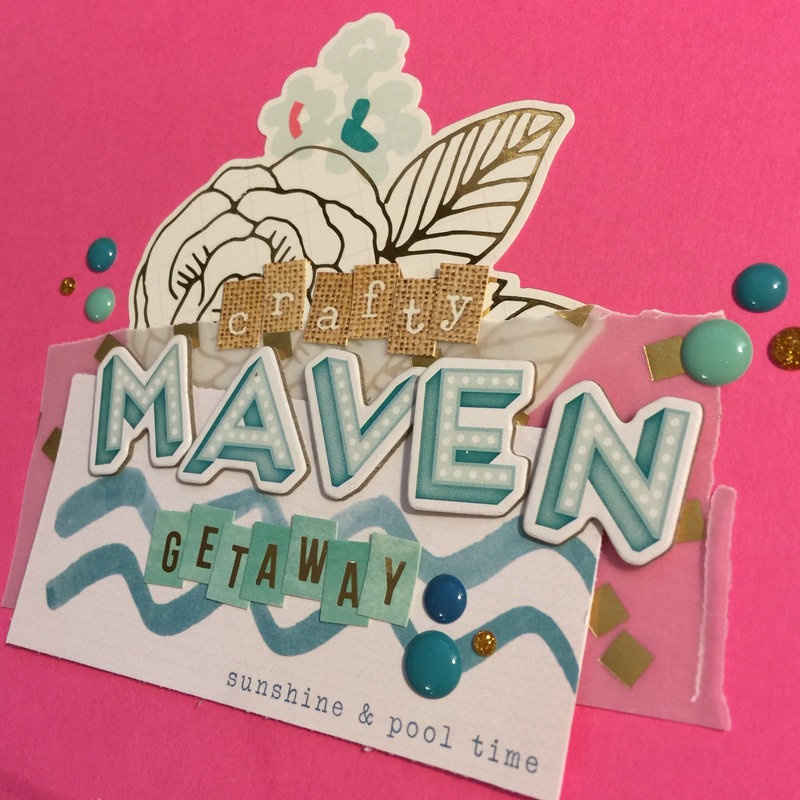 If you haven’t checked out The Crafty Maven Getaway YT Channel, you should, there is tons of inspiration and lots of scrapping and crafting going on. All the ladies from YT are so talented, and it’s a pleasure working with them. But because I have been so busy, I have been scrapping without my camera on!! I know shocking, because I love doing process videos. It has been kinda liberating though scrapping knowing I don’t have to think about the time, or camera, not that it keeps me bogged down much. For a change it is nice though. I want to share quickly with you a layout I worked on Wednesday for a sketch challenge over at the Victoria Marie Facebook Group Hump Day challenge. I love the challenges over on the group. I love that you can look through all the challenges and pick one and not have a time line too!! Here is the sketch I used from Scrapbook Circle. It’s fun and simple, leaving lots of room to interpret it how you want to. Those kinds of sketches are by far my favorite. I used cracked pistachio distress re inker with some water and used big paintbrush and swiped my brush across a piece of white cardstock. I didn’t use any gesso, I figured the little bit of media wouldn’t matter much as far as curling on the background. The light mint green color looks so nice on the white. It was the perfect starting point for this layout. I decided on using an almost black and white photo, the coloring I used let a little of the pink in my daughter’s shirt peek through. It was a little fun playing around in photoshop to create an unique filter for this photo of my middle daughter beaming as she sat up. Her smile is priceless!! I love that smile, it melts this momma’s heart. I went easy on the layers, just using some pink Dear Lizzy Fine and Dandy paper, some Websters Pages paper and a piece from the Maggie Holmes Confetti collection. I used a scalloped sticker left over from the Dear Lizzy Serendipity collection was a cool pice to layer in too. I liked that it added texture and was a little different then the punched school notebook layer the sketch used. For the journaling area I die cut out a Stitched frame from Amy Tangerine. It was nice to contain my journaling in that box too. Allowing for a place to journal that looked pleasing. Many times I just add the journaling at the end where it seems to fit, so this sketch made it nice bec ause it gave me a place that looked nice and fit into the design too. Because I can’t help myself but to add more layers and paper, I added two strips of paper at the bottom of the layout. I used a Multi colored dot from the Dear Lizzy Fine and Dandy collection and an old Amy Tangerine paper with plus marks, which I have to say I love this trend. The black also tied all the black throughout the layout together too. For the circle element I used a craft doily that I used pink stamping ink on with a blending tool. I then layered a flower sticker form the Serendipity collection. The bottom paper had yellow dots in it so I used some wash tape strips from the Amy Tangerine Rise and Shine collection. I scattered some pieces throughout the layout so I could build some clusters of embellishments. I used lots of circles from die cuts I cut out for another layout. Some of the circles had hearts, some circles were small and filled in, and some were thin. I used colors that matched the layout and added them randomly to the clusters. I made a banner and paired it with a Poolside banner sticker and some circles for the top cluster in the sketch. For the Title I wanted to use different fonts, so I used mint Elle Studio alpha’s in mint to tie the mint from the background. I used a Poolside sunshine transparency and some block alpha’s in black and white. I love how the col ors in the title match and tie in all the colors I used on the Layout. I finished by adding some wood buttons from the Poolside Collection and the new Shimelle collection. I added some enamel dots and black color shine splatters. I roughly outlined the border of the layout to bring your eye into the layout, plus it just seemed like a cute touch to this layout. I hope you scrappers are finding inspiration in the photos you are going to scrap!! I love looking at old photos of my kids and being inspired to scrap them in a fresh and fun way. Hey Scrappers!!! The weekend is soon approaching!! Yay!! I love weekends, relaxing watching TV Or Youtube in my case. Sometimes we even go to the beach or park!! It’s just nice to have no plans on the weekend since my families lives are so busying during the week. Recently my oldest daughter finished chemo, after over two long years, we finally get to see a life not focused on pills, and germs and mealtimes. To celebrate we are planning to have a party with are close friends. I thought it would be fun to make some homemade tags to hand out with the favors. I love the playful feel of the Crate Paper Poolside collection, so I choose to use a lot of elements from that collection. I started out by using a stencil, acrylic paint and some cardstock. I used two different colors, a teal and nice cream/natural looking cardstock. I use my blender tool with a foam pad and added the paint on through the stencil in different colors. Using long strips of Poolside patterned paper, I accordion folded the whole strip. Then glue the ends together and formed a circle. I used Chipboard in a circle to keep it laying flat. I used some fun silver paper on t op to cover the hole and to add fun die cuts or embellishments on top. I layered some stickers or vellum on the tags and added some letter stickers to spell out sweet treats. I also made a tag that said You R Invited. These tags were really fun to make, and a cool way to use leftover stickers or embellishments that I hard a hard time using on a layout. I can’t wait to use these for our Celebration party!! Hope you were inspired to make something different from leftover bits in your stash!! In Your Pocket: Hannah Lemieux. I wanted to share the video and blog post I made for a pocket page spread I made for The Crafty Maven Getaway YT Channel. Check out this blog post out!!! This spread was so fun to create!! I thought I would do something a little different today on my blog, first I am joining in for the first time in the Clique Kits Pep Rally. I love their Pep Rally and always enjoy hopping from one blog to the next looking at what different members did with their kits. And I am also going to post about two layouts today!! I decided to use sketch from Clique Kits this month by Amanda O’Banion. This sketch was really fun I thought I would create another layout after I used it once, but with a twist. The first layout I am sharing is a traditional 12X12 layout. I used my July Carpe Diem Clique Kit. This kit uses the Chickaniddy 365 collection. I love the classic look of the black and white, with the pops of bright colors. It was fun using a collection I wouldn’t have normally bought in the store. The black and white really leant well for adding lots of right mixed media too, which is always a great thing in my opinion. I then used my hero arts stencil from the clique kits store, and used a mix of two blue ink pads to ink dots in the areas of the watercolor. It looks so cool! It is often at these moments I think I must be crazy that I am going to be covering it up but this is the nature of the scrapbooking game for me. I really just love to play with all these art type products and if even only a smidgen peaks out it is always worth the work I put i nto doing all these extra steps. I picked out papers in mostly black and white. with all the bright colors in the media, I thought it would help the layout not look really busy. I picked out one paper with pluses that had color just to mix it up. I thought the coral color was a nice opposite from the green/blue colors on my background. On one of the black and white papers I used the watercolors and stencil on it to match the background paper. I backed my photos in a teal MY Minds Eye Cardstock. I decided not to fishtail one of my layers like the sketch, I think it looked better without it. I then picked out the background paper to back the mix media paper on. I chose a nice light blue in a ombre and triangle type of pattern. At first I almost went with a kraft paper with red dots, to match the dots like the stencil, but I didn’t like the red color with the coral color. And the kraft just didn’t look right. It was a pain to retake that layer off but it was worth it in the end. I followed the sketch pretty literal this time with the clusters and the title. I did this so I could play a little more with color. I grabbed my paints out again. I used an old alpha from a precious Clique Kit with Amy Tan Rise and Shine stuff, and used the Kraft Everyday Thickers. I love how skinny this alpha is, and the Kraft lends easily to change the color if you need too. I mixed the blue, teal and citron inks with a little white acrylic paint, a nd made a cool ombre effect, starting with the dark and going to the light green. I mixed these with the Chickaniddy’s black and white striped alpha, with a light ink wash on them. When I applied the striped alpha’s to my layout I outlined them to help the stand out a little more, I find they are kinda hard to read otherwise. Each cluster had cut aparts from the Paper add on from the July Kit which was the Seven Paper from Studio Calico. I mixed those with enamel shapes, small banners, and word stickers from the add ons and the oringinal Maggie Holmes Accent sticker sheet. I added a f ew scattered in making ink sketchy hearts from the Mommy Lhey stamp set, that was offered as an add on. They were Hawaiian themed so I couldn’t resist and had to get them. I really love how this layout turned out. I love scrapping the precious smiles of my kids. These photos were from 2012 and I love going back and seeing pictures of when my kids were much smaller. These pictures were took on different days but was a common occurrence in our house. The kids loved cuddling with Daddy while he sat at his desk and played on the computer. Even now the kids still try to sit with Daddy when they aren’t busy playing with their toys!! These are moments I don’t want to forget when they grow older and want to do their own thing. For My second layout I decided to do a 8 1/2 X 11 layout, Called Until The Cows Come Home!! I didn’t to do this because I am going to be starting a new series on my YT channel where I scrap old family photos and start to journal the stories from my family. I love fam ily history and I really don’t want to lose these amazing stories because I simply didn’t take the time to write them down. I am using photos that were given to me by other family members so most of them will be copies and not the best quality but I think when you are scrapping old photos it really needs to be about the journaling and telling of the stories in stead of the quality of the photo. I did a little mixed media on the layout, following the clusters as on the sketch. I really want to fretting up these old photos, and make them feel a little more current, because the story I am telling is the love of what my family member did for a living. My great grandmother and her brother grew up in Upstate NewYork on a farm, and it was a family affair and what they loved to do. whether it was because it really was all they knew or didn’t have the money to break free from the country way of life, I know they truly loved this life they helped build. My great grand mother’s brother even went as far as having his photo taken with his cows. this thought really makes me smile. Growing up seeing milk cows all over, I love that my family members loved nature and all that surrounded them that they took the time to have it photographed at a time when you saved pictures for things you really loved and held dear. The papers I used were mostly from the main July Clique Kits, the Chickaniddy 365 collection. This collection went perfect with the black and white photos, and added the color that was missing from these old photographs. I used lots of green and blues, to mimic the colors that would have been there originally in the grass and sky. The black and white definitely made my think of the spots from the cows too. I used embellishments fro last month’s June kit, from the Cr ate Paper Journey collection. The sentiments on them went perfectly with the theme of what I will be journalling later this week. I will be journaling on the back, so I have enough space to tell the story of my great grand mother’s brother and his farm! For the title I mixed July’s alpha’s with the block alpha’s from the Journey Collection sticker sheet. I liked the mix of black and white with the natural look of the cork. I ended with t he enamel shapes that came in the kit, the key was perfect!! I ended the layout with Heidi Swapp black velvet Color Shine Splatters. I really liked using this sketch with this smaller size. Even with two photos I didn’t think it was too crowded. It also helped me keep the layout simple so I could focus more on the story and journaling I want to add. I have a process video for this layout. Click here and watch my whole process. Thanks for stopping by!!! Don’t forget to check out the rest of the ladies participating in the Clique Kits Pep Rally. I really had fun joining in and sharing some stuff I have been working on this month with my July Carpe Diem Kit!! As I started to layer the papers with the background, I just wasn’t feeling it though. Something seemed off, even though it really didn’t look bad. I just seemed to be struggling to get the layers right and look amazing with this wonderful background I made. I decided to put away my layout and come back the next and see how I felt about. I tend to do that when I hit a wall. I walk away, getting irritated at my layout usually doesn’t help in my favor creativity wise. I find after sleeping on my layout and seeing it out throughout the day will give me time to think of new ideas, I will often spend my day going back to peek looks at layouts and thinking about what I want to do to finish things. When I came back later that night, which is usually when I have time to scrap, I realized it was the background and how big the layers were that I didn’t like. I wanted tighter layers with less paper showing around the two photos. Because the two photos were next to each other kinda overlapping they already took up a bit of stuff and I did want to see the background whether I kept the pink and purple one or decided to go with a different background. I worked carefully to pull apart the papers in my layers. I tried not to tear the paper so I could reuse it again for layers. It was then that I decided that I was going to use another background. I remem ber in my stash I had another backg round I made using mint acrylic paint and a stencil and some copper paint splatters on it. I often will make backgrounds when I am feeling creativity even if I don’t have a layout in mind. I use this as a way to try a technique too, but then if it doesn’t turn out then I can toss it. More times than not though I end up keeping the background cardstock and sometimes I use it later for another layout. I pulled that background out of my pile of other backgrounds I have made and thought about where on this paper I wanted my photos. I thought the bottom right hand corner was a good spot to see the background stencil but also get peeks of it behind the layers. I tightened the layers and added a couple of other papers, to help pull out the mint color from the background. 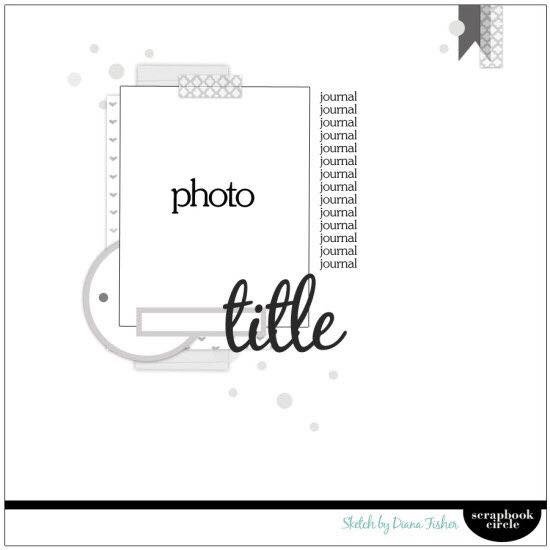 I added a journal tidbit from Elle’s Studio Shine tidbit pack, which brought in some yellow which was in the photo. I also adde d a copper striped bow at the top of the layout to tie in the copper splatters on the background. That bow made a nice place to have a tiny cluster which was staggered toward the layers, with some sticker banners in similar colors from the layers and some enamel dots. I added enamel dots near the title and around the layers and photos. The colors went well to tie everything together and added something different since I already had paint splatters on the background. I journaled which did spill off the card and under the layers, but I really wanted to make sure I told this story. Because Leilani had lost all her hair while on chemo I really wanted her to feel special. We let her have her hair dyed whatever color she wanted. She picked white like Elsa! She loved Frozen at the time, like many other children, and wanted to be just like Elsa. When you deal with chin everyday as a parent you really just want to make things fun whenever possible. So the fact that she had to lose her long beautiful blonde hair wasn’t ideal, but by dyeing her hair we turned that event into something fun and much more memorable. A better memory! I hope that you aren’t afraid to try over when a layout isn’t going the way you planned it. Or you take the extra set back to rethink photo position or even how the papers are layered on you page. Sometimes simple things changed like tightening layers or changing on or two papers can change the how feel of a layout. Sometimes it needs to be more dramatic, like changing up the background all together. But if that change changing how you feel about a layout I say it’s all worth it, right. Have an inspired week my scrappy friends!! Don’t be afraid to change things up!! I have a new series starting on my youtube channel. I am reaching deep into my scrap bin and pulling out papers to use on a layout. I don’t know if your scraps look anything like mine but it is starting to overflow. I have only been scrapbooking for one year, but I still have scraps from last summer, yikes!!! I really want to use them and cut down my scrap bin. I thought I would share my journey doing this. Also talk about different ways I like to pick out my papers to use together. Sometimes it’s hard to match papers to use on a layout when they are all mixed together in a scrap pile. There ar e lo ts of ways you can narrow down to a small amount papers to add to a layout. By colors, patterns, theme, or using a picture from Pinterest as inspiration too. I will over this series go through many of these ways to pick out papers for a layout. This week I am picking out papers based on colors. I used this mood board from Pinterest to use as my color inspiration. I find using a picture or mood board helpful to match colors. Especially because I am so visual color to me is big, I love matching colors or using lots of bright colors. This paper choosing was really fun, using these summer and bright colors. I will mention that at this point I do not have a photo picked out. I want this to be about picking papers based on the mood board. About 3/4 the way through this paper picking process, I started to think about what photo I had printed that would match the colors i was picking. Here is the lin k to the video where I talk through this paper picking process. I decided to use a gorgeous photo I took of a North Shore beach. The colors in the photo matched perfectly with the colors I picked out with papers, Blue, teal and yellow. I was surprised at how well Park Bench papers, Amy Tan Rise and Shine, My Mind’s Eye The Sweetest Thing and a couple of other various papers, went together and almost looked like one collection. I used watercolors on white cardstock as a base. I wanted a good balance of color and white and watercolor is a good medium to do that too. I then of course couldn’t stop at just watercolors, I wanted to use a stencil. I didn’t know if I wanted use white modeling paste to cover up the beautiful color. I decided to use Multi Medium, because when it dries mostly clear and enhances the colors underneath the stencil. I decided to stick with using embellishments that color matched the three main colors in my papers and on my background. I choose to only do three embellishment clusters around the page too. The Crate Paper Poolside was the perfect compliment to the paper selection I made. To see my process you can watch scrapbooking process video. I really love the way the layout turned out, oh man it makes we want to go back to the beach with a fresh lemonade and soak up the sun!! I hope I inspired you today to dig deep into that scrap pile and pick some papers even before you pick a photo. I wanted to share what I have been up to lately and something I have been working on!! Something really exciting. The first day has actually come!! I am so thrilled to be working with such an amazing and talented group of ladies, who have inspired me since I have been scrapping!! For the first Spotlight Sunday, we are featuring me, Hannah Lemieux. In this first spotlight video, I mention all the ways you can find The Crafty Maven Getaway channel on social media. I also mention where you can find my channel on Youtube. I just wanted to jump on quick this morning, before my day got busy, grilling and bonding with friends over great food, and sunny skies!! I just wanted to wish all my American friends a very Happy Independence Day!! Being in a military family this day is even more meaningful to us, and I am proud that I can do my part and make a better country and world for my children!! Even if my part is to document my families journeys with pretty paper and embellishments!! May you all have a great day and even better weekend!!! You may have noticed I have been a little MIA lately!! Well I have been working like crazy! Things in my life have been pretty busy, I have finished my kids school year, I homeschool my two daughters. My oldest daughter is just about to finish her chemo treatment, so we have been doing things around to get ready for that. On Tuesday she actually had her last dose of IV chemo in the clinic. We are so glad this day has come and we are planning on celebrating with a party! On top of all this I am actually working on something really fun and cool for all you scrappers out there too!! maybe you have heard, but if not I am currently working on starting a new Youtube channel where a bunch of Scrappy Youtubers will post a project or layout once or twice a month. It is like a youtube hop and 2peas combined. 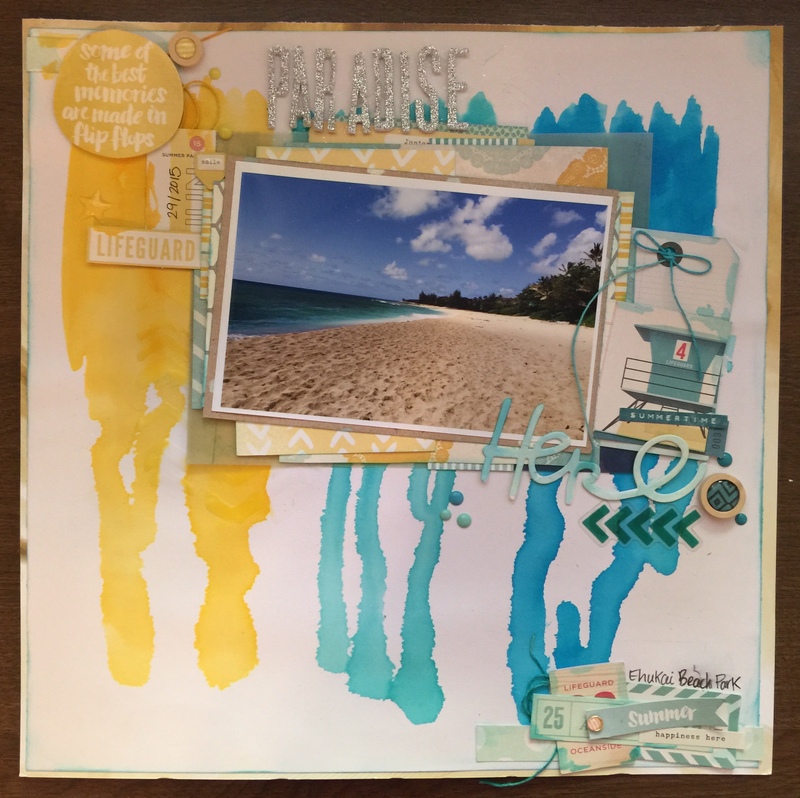 Each week there is a new piece of inspiration that the scrappers will use to connect all the weeks worth of layout/projects together, but viewers will be able to see how each scrapper uses and interprets this inspiration piece. Giving them ideas and giving them an inspiration vacation!! The name of this new Youtube channel I am working on is The Crafty Maven Getaway. Aside from the Youtube channel there is also a blog to go along with the Youtube Channel where I will be linking the videos that are posted and where you can find the poster on Youtube. The blog website for that is www.thecraftymavengetaway.wordpress.com. There is also a community Facebook page as well which is like a blog on Facebook, but may be a little easier to comment on the layouts and videos than on a blog. Everyone who is involved is getting really excited and ready to share with everyone what they have been working on, I hope you scrappers are excited too, because so many Youtubers are going to be in one place posting everyday!! Some days even have more than one post!! I will keep you posted on my new Youtube channel and I will be trying like allows to keeping up with my own layouts that I am working on! !